Frequency fields. Milena Kipfmüller & Klaus Janek will engineer a solid set as composition instrument. At the beginning of the research tehy decide about abilities and aesthetic characteristics of the instrument, which will intrinsically define its sounding and performative qualities. At this stage a guest from Berlin, Lukas Matthaei will work with them. Then they go through try outs with a smaller audience, installing a performative situation in an indoor space, being a stage, a hall, a smaller room, etc. The feedbacks from the listeners give the possibility to go further through the process, bringing the instrument to an outside, urban environment, where the city and its notches (Kerben) puts the work/composition into friction with a specific shaped and resonating space. 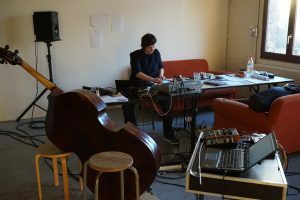 At last Milena Kipfmüller & Klaus Janek will try out the possibility of composing in a mobile way, integrating live recorded and processed sound of outside. Specific spaces and its acoustic qualities function as analog live effects as part of the composition. 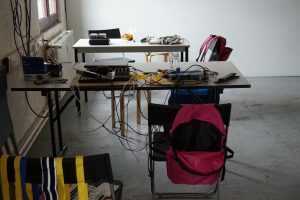 They experiment with an instrumentation of double-bass, oboe, recorder, laptop, analog gear, pickups on a variety of objects, voices reading text (recorded or live), radio-transmitters and radios. We, Milena Kipfmüller and Klaus Janek, met during the development of a performative project where sound and urban space were used as a foil for examination of the German participation in today’s wars. After that, during a year long process, it became a radio piece that we perform live with different local guests, therefore scanning different environments and possible interpretations. This work leaded us to a profound development of radio and soundwork that deals with aspects of processing of musical material, field recordings and language based sound, that, interconnected, change their original definition and become a net of sounding meanings. By the use of the compositional and performative strategies these are constantly redefined. We work on a collaborative and artistic research about the development of a “performative instrument” under the perspective of its philosophical, conceptual and artistic production processes. We both started studying music and then reached out for different directions, over collaborations in performance (deriving from fine arts and dance/theatre), architecture and photography. This makes the faculty of each owns language specific and leads to an inevitably necessary collaboration as an artist entity, which we would like to develop further and strengthen during the residency period. We feel the necessity to take a closer look to the activity of composition or the multiple fields a composer has to work on. The actual definition of composing derives from the Latin “componere”which literately means to assemble. But what we commonly mean by composing tends towards creation of music. So the composer is mainly the creator of the music and the executor is the interpreter of the score, or the concept created as score. From this thought we would like to deepen the idea of creating music (instead of composing music) by examining the activity itself, and deconstruct „creation“ into different elements: sound objects, process methods and composition techniques. From this position we feel the urge to research and develop an instrument in order to process artistic content. a) performance situation, b) live installation, c) mobile act. We work with different kinds of radio devices and the technique of radio transmission, which enables us to use it as a flexible and portable engine for moving performances. The instrument is mounted on a belly tray and transmits the creation via radio frequencies onto portable radio devices, used with or without headphones.The instrument characteristics consist of three fields: sound source, method of processing, composition technique. In previous works we experienced these fields in a way that we are sure about them as a choice – in that a certain presetting is given. The sound source we are using are acoustic instruments (which we play), ambience (live and or recorded) and word-based voice. The method of processing are analog, digital and performative. The techniques of composition are assembling, overlaying, arranging, manipulating, repeating. We are planning to work first of all on the set itself with the goal of the set fulfilling our artistic needs in terms of haptic behaviour and immediacy of the realization of an idea. The set should be easy and immediate to handle. 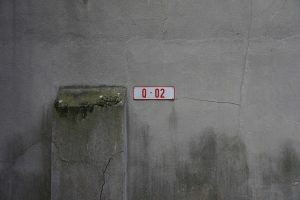 As second, the set has to function as a working tool of artistic expression, without influencing or colouring too much the result. It needs to be as neutral as possible taking in consideration, that it is anyway by its means and specific existence a statement in it self. The set in general should not only respond auditively but should include the possibility of being staged on a performative level. We plan to work during a period of four weeks, where we engineer a solid set as composition instrument. The first week we decide about abilities and aesthetic characteristics of the instrument, which will intrinsically define its sounding and performative qualities. During the second and third week we go through try outs with a smaller audience, installing a performative situation in an indoor space, being a stage, a hall, a smaller room, etc. The feedbacks from the listeners give us the possibility to go further through the process, bringing the instrument to an outside, urban environment, where the city and its notches (Kerben)2 puts our work/composition into friction with a specific shaped and resonating space. 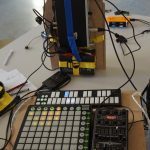 In the fourth and last week we will try out the possibility of composing in a mobile way, integrating live recorded and processed sound of outside. Specific spaces and its acoustic qualities function as analog live effects as part of the composition.